Grace is an ordinary little girl, but she does not live an ordinary life. Born within a fundamentalist Christian community, she is sheltered from the rest of Australian society, unable to interact with “sinners”, and forced to follow harsh, chauvinistic rules. But Grace still has fun in her life, mainly thanks to her much-loved father who allows her freedom to thrive and think, despite it being frowned upon by the Church elders. But when he goes too far and is expelled from the community, Grace blames herself. As her world gradually closes on her, suffocating her, she is determined to find her father, even if this means crossing the line into the world of sinners. Grace has got to be one of the most endearing characters I have read about in a long time. Her innocence, teamed with an amazing strength of character drive this short story and make it not only an entertaining but also a captivating read. Grace’s community is what I guess could be described as Catholic extremists. They have a strict hierarchy, with women at the very bottom and are not allowed to mix with people outside of their community. They have their own school, provide work for the men by owning a couple of factories and live very much secularly. Grace’s family is different though with a father who has a questioning and open mind, which is, eventually, his demise. Grace’s innocence allows for the subject of sects to be seen in a touching, often funny, and always honest way. Gleitzman has a real talent for seeing things and telling a story through the eyes of a child. This talent has really bowled me over when I read Once. and Grace only proves how talented a writer he is. He can mimic children’s speech beautifully and manages to communicate their view of the world perfectly. Grace isn’t an anti-Christian story; in fact both Grace and her father, despite questioning their Church, are profoundly devoted to God. But what Grace denounces is sectarianism, intolerance, the denial of women’s rights, the dangers of rigidity of beliefs. It is, at times, simply heartbreaking, knowing that children actually do live within similar communities. Grace’s love for her father and family is also incredibly touching. But it is also hilarious at times. 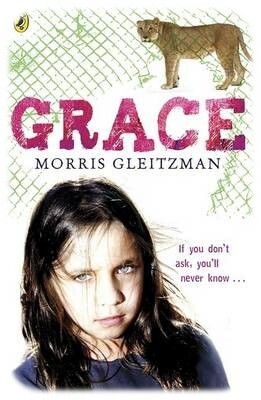 Grace is a wonderful book which manages to deal with very serious issues with an often light-hearted tone. It is another great book from Morris Gleitzman whom I urge you to discover if you have not done so yet.